As soon as anti-Islam activist Pamela Geller’s purposefully offensive new subway ads went up, they were promptly ruined and remixed by protesters, at least one of whom was arrested. The guerrilla campaign was one thing, but now the "Defeat Jihad" posters, which allude to Muslims as "savages" in ten stations around New York City, will have some legal competition: The Jewish group Rabbis for Human Rights and the Christian organization Sojourners are debuting a counterattack next week. "In the choice between love and hate, choose love. 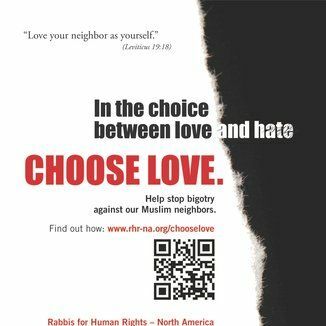 Help stop bigotry against our Muslim neighbors," says the Rabbis’ version, while the other reads simply, "Love your Muslim neighbors." Rabbi Jill Jacobs explained to the Times, "We wanted to make it clear that it is in response to the anti-Islam ad." Point taken — and appreciated.